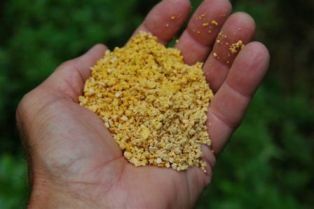 Corn gluten meal: This is the protein fraction of the corn kernel and an organic “weed and feed” fertilizer. It is a powerful organic fertilizer and has pre-emergent weed control capabilities. The timing for applying corn gluten meal for pre-emergent weed control is just before the weeds start to germinate. We usually guess that to be February 15 to March 15 in the spring and sometime around September 15th for the fall application. CGM has about 60% protein that equals about 9.8% nitrogen. The analysis on the bag will usually be 9-1-1 but it’s actually higher than that.